PKS Foundation of Australia members submitted photographs of their children to be used in a research study by Dr Thomas Liehr et. 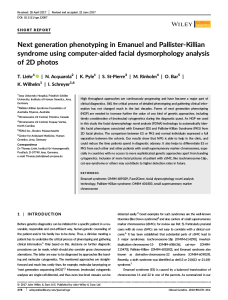 al., looking into the identification of Pallister-Killian Syndrome using computer-aided photograph analysis. The work has been published in Clinical Genetics, in a paper co-authored by PKSFA president Nic Acquarola. This entry was posted in Communication, Media, Research by Tim Paton. Bookmark the permalink.